During a study to learn how deep-sea sediments flow through submarine canyons, a one-ton monitoring device has been swept down Monterey Canyon and buried—twice in one year. 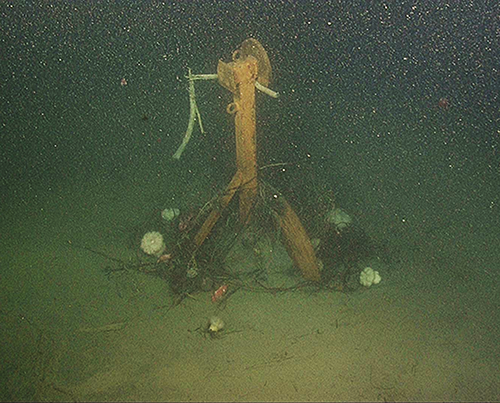 The device, a large steel tripod, was designed to hold instruments that measure subtle movements within the seafloor. 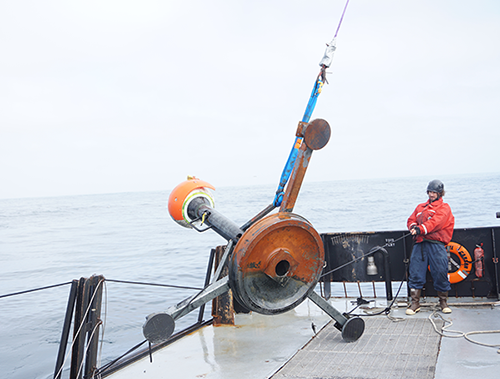 It was placed at 300 meters depth in the axis of Monterey Canyon and is one of many instruments involved in a two-year geological study called the Coordinated Canyon Experiment. The tripod frame was designed to withstand submarine turbidity currents. It weighs a metric ton (1,000 kilograms or 2,205 pounds), and nearly half of this weight comes from a 500-kilogram (1,100-pound) locomotive wheel that is welded to its base at the center of the tripod’s legs for an extra measure of stability and weight. The instruments attached to the steel frame were designed to detect movement of the frame ranging from slow, fine-scale settlement to lateral displacements of approximately 100 meters (330 feet). When an especially strong down-canyon flow event occurs, a float at the top of the frame releases and ascends to the ocean surface. A transmitter on the float alerts scientists onshore that it has surfaced and lets them know that a powerful flow has moved down the canyon. In January 2016 transmitters from multiple devices sent alerts that a strong sediment flow had occurred. In subsequent days, researchers searched for the tripod. They followed signals from acoustic beacons mounted on the tripod frame and were surprised to discover the signals originating five kilometers (approximately three miles) down canyon from the frame’s original position. 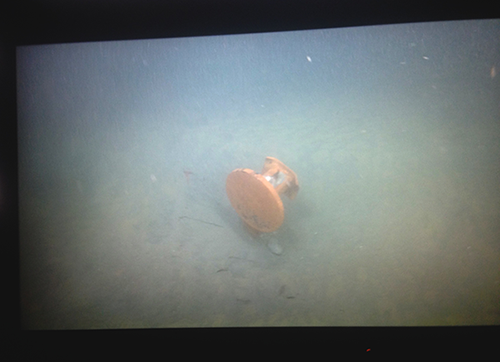 Using a remotely operated vehicle (ROV), they found the frame buried in canyon floor sediments with one leg sticking up out of the mud. 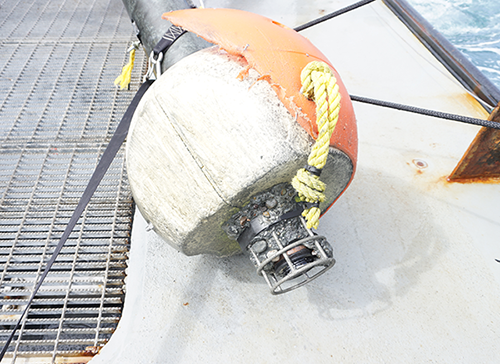 The ROV pilots succeeded in tying a hoisting line to the exposed leg and bringing the other end of the line to the surface, enabling the crew of the R/V Rachel Carson to pull the damaged frame out of the sediment. The parts of the frame that were sticking out of the sediment were covered in orange rust. However, the parts that were buried in the sediment had been scoured down to bare metal. When researchers looked closely at the frame, they could see that the half-inch steel plates above the feet on the tripod frame were bent and ground down along an edge as if they had been sharpened like a knife. The spherical float, made of very strong and resilient syntactic foam and covered with a carbon fiber and titanium pressure case, was badly damaged. This illustrates how powerful an event on the canyon floor can be. Researchers are unsure whether the event was unusually strong or whether events of this magnitude are common. After the January 2016 event, the frame was repaired and redeployed into the canyon. However, on November 24, 2016, another large event occurred. This time the frame travelled down the canyon for 700 meters (2,297 feet) and was buried even deeper in the mud, with only the tip of one foot visible. This second event buried the frame so deeply that it will be very difficult to pull the whole thing out of the mud. Researchers are currently evaluating alternative methods for rescuing the frame, as well as reconsidering the potential magnitude of turbidity currents in Monterey Canyon. October 5, 2018 – A new paper shows that currents in submarine canyons often involve large-scale movement of the seafloor. This discovery could help ocean engineers avoid damage to pipelines, communications cables, and other seafloor structures. Aug 1, 2018 – The Society for Sedimentary Geology recently awarded MBARI Geologist Charles Paull the Francis P. Shepard medal for marine geology. December 11, 2017 – Results of the Coordinated Canyon Experiment presented at the Fall 2017 meeting of the American Geophysical Union. Feb 6, 2017 - During a study to learn how sediments flow through submarine canyons, a one-ton monitoring device on the seafloor was swept down Monterey Canyon and partially buried—twice in one year.